Phutsok Rinpoche, the diminutive 12-year-old reincarnation of the late great yogi and meditator, Geshe Lama Konchog, has been secretly attending school for the last three-and-a-half years in Perth. His seclusion was ended when, accompanied by his attendant in this and the past life, Geshe Tenzin Zopa, he was welcomed to our Centre on Monday by our resident teacher, Geshe Sonam, Ven Robina Courtin and more than 90 students. 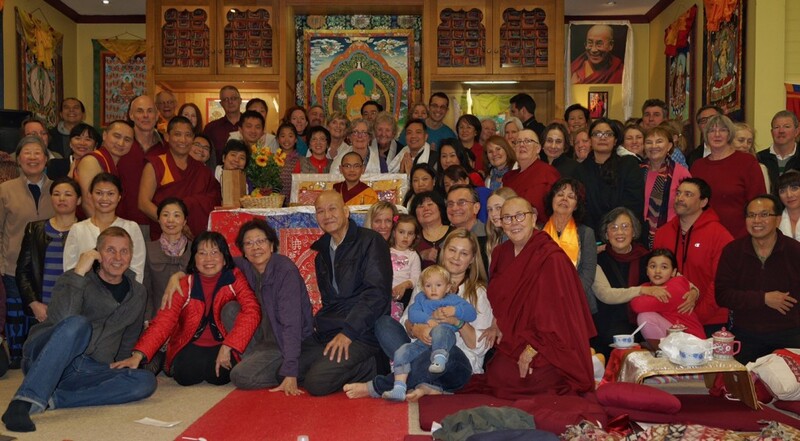 Geshe Zopa explained they had kept their presence in Perth quiet as Phutsok Rinpoche couldn’t say no to the many visitors he had while in Kopan which interfered with his studies. Geshela decided Rinpoche should receive a western education – a decision opposed by many but which came with the blessing of their Guru, Kyabje Zopa Rinpoche. Geshela also said that the move had been planned with the late former Abbott of Kopan Monastery, Khensur Rinpoche Lama Lhundrub. Perth was chosen because of a friend in the city and Geshela said they lived in Victoria Park throughout their stay. Geshe Zopa said he passed our Centre often and it broke his heart that they couldn’t go in but he knew it would interfere with Rinpoche’s education if word got out that they were in Australia. Rinpoche attended school in lay clothes and Geshela picked him up from school similarly dressed. The school had no idea they were monks. During their stay Geshe Zopa did Yamantaka retreat in their Victoria Park house which he said showed you don’t need a cave in Nepal to do a retreat. Speaking fluent English, Rinpoche said his favourite subjects at school were maths and philosophy. He is also highly interested in science. Geshela said many lamas, including His Holiness the Dalai Lama, emphasize the importance of understanding science as lamas need to understand the culture to teach the dharma in the west. Geshe Zopa said high lamas now spend more time teaching in the west than in India or Nepal as Buddhism is becoming more established there and that it will take root in the west as it did in Tibet. Phutsok Rinpoche’s time in Perth has ended and next month he will start studying in India’s Sera Jey Monastery where his attendant will be Geshe Zopa’s brother who also served Geshe Lama Konchog. Rinpoche had total control of the event during his visit to Hayagriva leading the prayers and giving transmissions of the mantras of Hayagriva (a practice of Geshe Lama Konchog), Chenrezig and Manjushri. This followed the offering of the body, speech and mind and the traditional offering of sweet tea and rice which was given to Rinpoche and all the guests. 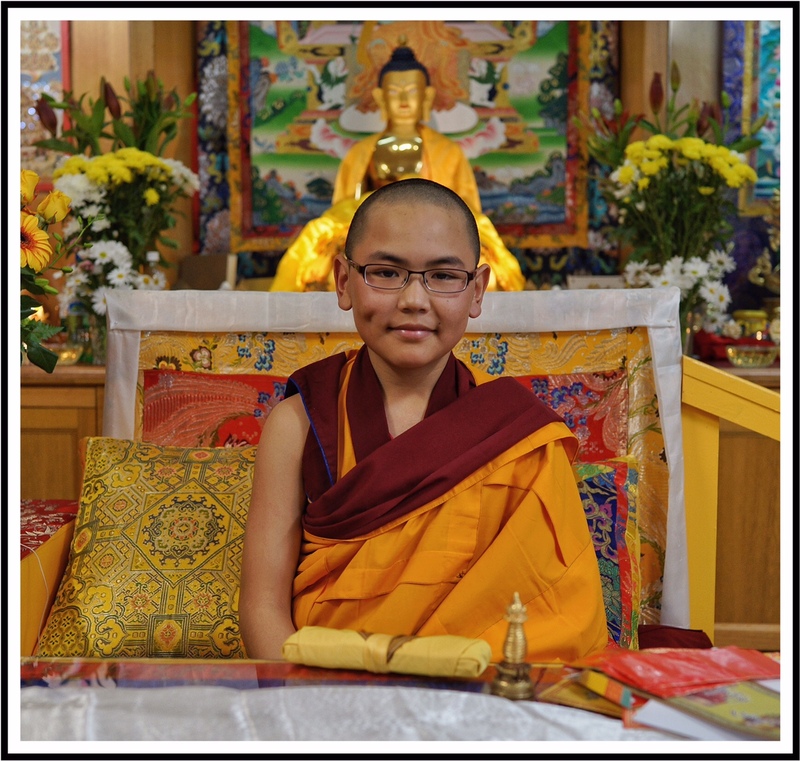 Answers to questions from students were short and precise in the best Geshe Lama Konchog tradition showing a wisdom and maturity way beyond what could be expected of a 12-year-old. Topics ranged from how to develop a good heart in the young to overcoming fear, dealing with the environment, preparing for death, and one from a student who wanted to know about their past and future – just focus on the present was his reply. Rinpoche and Geshe Zopa visited the Hospice of Mother Tara in Bunbury last weekend and will visit other Australian FPMT Centres in coming weeks. This entry was posted in Visiting Teachers and tagged rinpoche, special events. Bookmark the permalink.